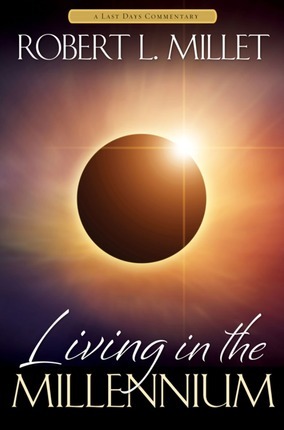 In Living in the Millennium, the companion volume to Living in the Eleventh Hour, author Robert L. Millet opens the doors wide to show us what life will be like during and after the Millennium. Relying on the words of ancient and modern prophets, he shares what has been revealed about Christ's preliminary appearances, His return in majesty and power, and His millennial reign—a thousand years of goodness and peace. This is a companion book to Robert L Millett’s Living in the Eleventh Hour published earlier this year. What I really appreciate about Living in the Millenium is the scriptural basis. Brother Millett takes a purely doctrinal approach to explaining to readers what life will be like before, during, and beyond the Millenium. I had previously heard many of the scriptures by themselves, but seeing them organized and combined into one reference taught me in a clear manner. Millett’s tone is hopeful and cheery, however, he also admits to personal trials, the wonderings and hardships that come with mortality. I loved reading about how the author overcame worry, and felt the peace that comes with the Lord’s assurances of the resurrection. For anyone with questions about the second coming of Christ, life after death, how our bodies become whole or what the reign of peace will be like, this book holds answers. In the end, there is a glossary, notes, scripture and subject index for readers to truly “dig in” and learn the teaching firsthand. A short read, this Last Days Commentary will help each individual and touched my heart personally. The more I have thought about it, the more fully I realize that from a Restoration perspective, love is intended to last longer than time, to span the veil of death and continue everlastingly. For those without such understanding, however, “till time stands still” or “to the end of time” seems like a pretty significant and long-term investment of one’s love. Let’s consider this passage of scripture: “And the angel which I saw stand upon the sea and upon the earth lifted up his hand to heaven, and sware by him that liveth for ever and ever, who created heaven, and the things that therein are, and the earth, and the things that therein are, and the sea, and the things which are therein, that there should be time no longer” (Revelation 10:5-6; emphasis added; see D&C 88:108-10). We are told in the Doctrine and Covenants that “it is required of the Lord, at the hand of every steward, to render an account of his stewardship, both in time and in eternity. For he who is faithful and wise in time is accounted worthy to inherit the mansions prepared for him of my Father” (D&C 72:3-4). I presume there will always be what might be called durational time, the fact that event A took place before event B, or that we declared C before we uttered D. What the scriptures seem to be saying, however, when they speak of time being no longer is that mortal time, or mortality, will be no longer. That is, a day is coming in the not too distant future when mortality as we know it will be no more; we will no longer be reckoning our words and our actions according to this world’s calendar but rather we will be tuned and acclimated to eternity. We have been counseled by the prophets to improve our time, that is, to make wise and effective use of the day in which we live on earth, for how we will spend eternity will be inextricably linked to how we spent our time in this life. And so we are told that “this life is the time for men to prepare to meet God; yea, behold the day of this life is the day for men to perform their labors” (Alma 34:32). life within the kingdoms of glory, the many mansions of the Father. I have therefore chosen to quote more extensively from holy scripture and from the writings and sermons of apostles and prophets than I am generally accustomed to doing. Although I do not wish to burden the reader with excessive support and substantiation, I do want to be as doctrinally sound and as loyal to the Lord’s anointed as I can. Operating in harmony with such restraint, let us proceed on our journey. And what a journey it will be! What an encounter will be ours as we make our way through the prophetic word and contemplate the glories that await the true and faithful. Looking to the future will do much to motivate us to get our lives in order while we are still living in time, for eternity is just around the corner. In addition, a view of the future can fortify us against the discouragement that inevitably follows from the pain and distresses of this fallen world; it provides us with a perspective that produces gospel gladness. 1. Smith, History of the Church, 1:338; emphasis added.